Data security protects your sensitive business data. 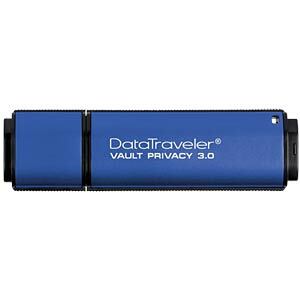 Kingston DataTraveler® Vault Privacy 3.0 (DTVP 3.0 ) USB Flash memory offers affordable business-grade security and encryption using 256-bit AES hardware in XTS block-cipher mode, which provides greater protection than CBC or ECB mode. A complex password with minimum requirements must be specified to securely protect all data saved on the stick against unauthorised access. 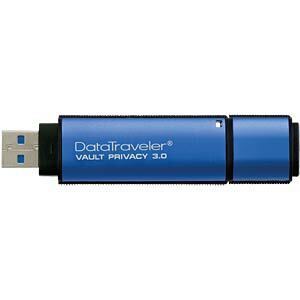 For additional security, the drive automatically locks and reformats after 10 invalid access attempts. Features a read-only mode to protect against potential malware risks. • Robust - Data is well-protected in the resilient, waterproof aluminium enclosure. • Guarantee - Five-year guarantee and free technical support for additional security. 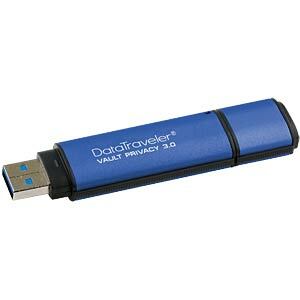 Companies can adapt many functions of the DTVP 3.0 to suit their specialist requirements. These include the most commonly requested corporate IT requirements, such as consecutive numbering (using standard characters or as 2D and 3D bar codes), the number of password attempts, minimum length of the password and individual product identification (PID) for standard endpoint management software (Whitelist). The DTVP 3.0 comes with a five-year warranty and free technical support based on the legendary Kingston® reliability.